A blog about the production of the short film " The Once and Future Bride" -- While choosing a wedding dress, a young woman, her best friend and her mother explore the meaning behind making life choices. Combined with the story of a young teen bride, the mother accidentally ingests a hallucinogenic and we learn the mystery behind her concern. In the end, people just choose, then move on. We're already reviewed 7+ minutes of semi-edited footage and it looks good. I like the pace. But most importantly I like the ideas. After figuring out how to store the footage, what level to edit, how to set the levels, I think our post-production team is in a good spot. So that we can make our time and efforts more efficient, the scenes that need special effects are being cut together first so Matt can work on only those frames that we need to have effects on. Nice little plan. It's throwing me off a little though... I don't like building the story from the inside out, but I'll go with it. Our hearty editor for this project is Raymond Scott Daigle, who I have discovered is smarter and more patient than I could even have imagined. I met Scott a couple of years ago through his wife, the lovely Maria Shanle. We all have common friends (Two Sticks, Frisbee people, law school folks, etc.) and our orbits have passed a few times. When Mick decided he didn't have the time to edit the film, I called a couple of people who might be interested, but I just wasn't feeling comfortable. After a quick afternoon visit at my brother's (Scott was there with his baby daughter Sagan), I gave Scott a call and passed him the script. We chatted, I viewed a couple of his videos, and trusted my gut. I have worked with all of my core team before on a lot of different projects, but this was the first key player that I hadn't worked with. All you have is to go with your instincts. Best decision I ever made. Editing is making the movie again. It's where you see what you actually shot and what shots you have to work with. It's where you create the energy, the pace, the focus, the direction. I have worked with a spectrum of editors, each of whom have their own style. Sometimes you see a flow that you hadn't seen before. Other times there's a little effect thrown in to accent just that moment of drama, something that makes you look at the scene again, a little flair. Plus, the editing process makes you not only appreciate your editor, but your camera people as well. I have found myself saying, "Oh wow.. I had no idea he got that shot," which just adds to the recipe. With our new sister iMac 7's, we've been able to link up via iChat and preview edited sequences. The first segment was the hallucination sequence. After the first preview I hesitated. I was surprised. But then I saw it again and got it. Scott had cut it tight, in quick short cuts, cuts almost disruptive, but they conveyed the sense of time passing that we needed. This scene happens fast but it need to communicate more time. It worked and was funny. I laughed watching it... at least the 3rd and 4th time. The first time I was just absorbing it. And he has been blessedly kind about explaining the rudiments of Final Cut to me. So yes, big editor love. It's working nicely. And there's a reason they call your gut "the second brain." Follow that. It talks back. Raymond Scott Daigle is a videographer who specializes in production from concept to reality. His focus is on creating a smooth and painless process, with a high degree of creativity and visual stimulation. Based in Northern California’s Bay Area, Daigle Digital has worked with clients such as Benziger Winery, Kunde Vineyards, Annie's Organic and Scharffen Berger chocolate. He’s also written and directed his own short film Replica. 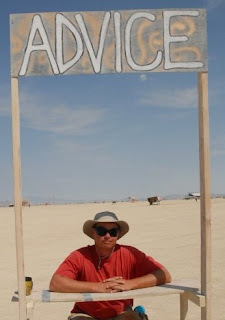 Originally from Maine, he has a degree in film from the University of Southern Maine, enjoys his annual trips to the desert for Burning Man, and hopes to meet Bigfoot in person one day. You can see some of Scott's editing skills via his website at Daigle Digital. As we progress through editing we're also trying to get our effects done and find some solid usable music that will move through the film. The music part is something we have a handle on. 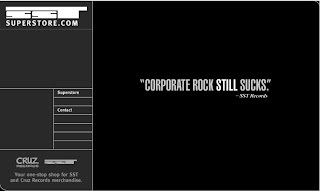 In the 1980s I worked for SST Records. Originally hired as an editor/ proofreader, I became the desktop publishing queen and the music licensing gal, which means I did the contracts for soundtracks and licensing, working with music supervisors in film and TV. In my job, I watched a lot of surf and skate videos and was proud to be a part of the Repo Man team. So we're okay there. But it's the techies who rule the editing world. And this director ain't no techie. I've played with Avid, Premiere and Final Cut Pro. I can do titles, transitions, cut frames/seconds... but converting, FPS, transcode blah blah blah, sequences, bins... it's all a cloudy, foggy haze. Editor Scott Daigle sent us an email this weekend. Back and forth it went between me, Scott and our trusty special effects guy Matt. When Scott finally asked me what I thought, I paused, then said, "Uh, I have no idea what you're talking about." It's just .... BLANK. Empty. Vacant. Learning is good. Learning is hard. But I know what I like, what looks good, what feels right. So when I'm reviewing edited sequences and special effects, my eye is always on the bigger picture: the flow, the energy, the pace, the "blink." I have great admiration for my post-production team. I'm the snail here, the loose link, the easy rider. They're puttin' down the tracks and I'm just there to make sure the train stays on the straight and narrow. Sometimes when I shake my head you can hear the clink and clank. Filmmaking is a team sport. We can't do it alone; I don't care what James Cameron thinks. Rebels aren't really loners; they're just non-conformists. And vacant. Sometimes. And that's okay. Rock on people. In 2004 and 2005 I lost two of my beloved Aunties to cancer. Feeling helpless and craving somewhere to focus my energies, I joined the Leukemia & Lymphoma Society's Team In Training and spent four years doing triathlons and raising money to help cure blood cancers. For my 2006 triathlon team I was voted Honoree Captain and had the great honor of scheduling the inspiring talks from people who were struggling with cancer. One of our honorees was Matt Rhodes, a Stage 4 leukemia survivor. We had a great season training together and his journey was motivating to all of us. Plus, he made me laugh, loved eating cheeseburgers after working out, and mixed up some tasty cocktails. 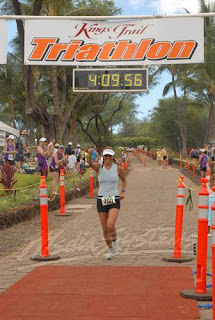 With his wife Claire we all went to Hawaii and competed in the most amazing Olympic level triathlon on the beach in Maui. We had some great bike rides together too, and the best part is that you can actually see Claire and Matt cheering me on as I crossed the finished line. (Yes, that means they were pretty much done while I was still slogging along...) I figured it was a sign of our brotherhood/sisterhood/familyhood. I was working on a video for the Alaska Federation of Natives and knew Matt did some film and video work, so I hired him to create the animated effects and educational sequences to insert within the program. Later, when my favorite rock band, Two Sticks, wanted to make a video, we called Matt to help us edit it together, and included a photo of Claire in the infamous jean jacket for the DVD cover.... 'cause Matt and Claire are "like peas 'n carrots" (in Forrest Gump talk). Using footage from four cameras, I'm amazed at how creative he is and what he was able to come up with. So of course he had to be on the Bridal Film team. He specializes in special effects and has a great eye. In January we met at the Marin Brewing Company to catch up, talk about the movie, and download footage from scenes for special effects. It's always memorable with Matt. Not only did we have a great time, but my car got hit in the parking lot, door folded like the page of a book, in the pouring rain, by two women going to 24-Hour Fitness in a red car with Louisiana license plates. It's another sign of our family bond. The Bridal Film team is lucky to have him and I'm excited to see what he's going to do with our hallucination sequences. Plus, now I have an excuse to hang out over at their house more. I'm adopting them both. Matt Rhodes started Motivated Pixels in 1999 as a way to provide his services and experience to various marketplaces, including the interactive community, the game industry and the visual effects industry. With Santa Barbara Studios, Matt wrote custom software tools for the production of An American Werewolf in Paris. Working with the head of Research and Development, Matt wrote a portion of Santa Barbara Studio's hair renderer, now licensed to Alias. He was also responsible for creating most of the in-house Softimage plug-ins, mental ray shaders and custom tools needed for the Werewolf production. Matt continued with this role during the productions of Spawn, Parasite Eve (video game), and Paulie. As the head of software at Santa Barbara Studios during the production of Star Trek: Insurrection, Matt wrote tools, plug-ins and shaders for Maya, RenderMan, and mental ray. His volumetric shader was used to create 3D cloudy shapes for the film’s briar patch sequence. 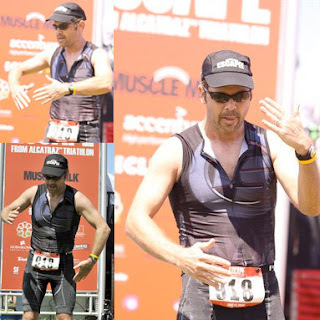 * Photos of Matt doing the robot across the finish line at the Escape From Alcatraz Triathlon. You can learn more about what Matt does on his website for his company, Motivated Pixels. Or better yet, check out his personal videos. Like I said, he's a funny guy. Plus, he looks pretty cool with all those cookis in his mouth. Donate Now to Support our Film! We only need $2500 more to complete post-production. Donate today! What do you want to read about on our movie production blog? MARIA COLLETTE ~ Writer. Adventurer. Believer. Turning travels and stories into fairy tales.